Happy Friday friends!! We made it to the end of the week! That alone is worth celebrating! We have a fun weekend ahead celebrating our 2 year-old nephew’s birthday. We’re squeezing every last drop of Summer break before school starts in just 2 weeks! I really can’t believe it’s coming to an end though. We have loved having James home all day. Did you see his reading recommendations?! I loved hearing your feedback on bringing Ali-Shaun back for a trip to the dressing room last week. It was my hope that seeing clothes on both of us would be helpful for envisioning those pieces on yourself and you definitely said it was. 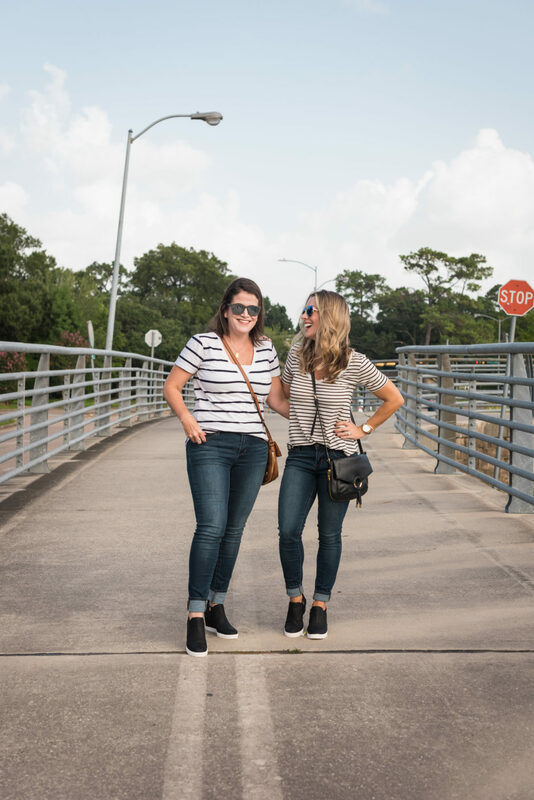 Today, I’m bringing this girl out of the dressing room and into the light of day for a post where you can see all of our favorite outfits styled in real life! 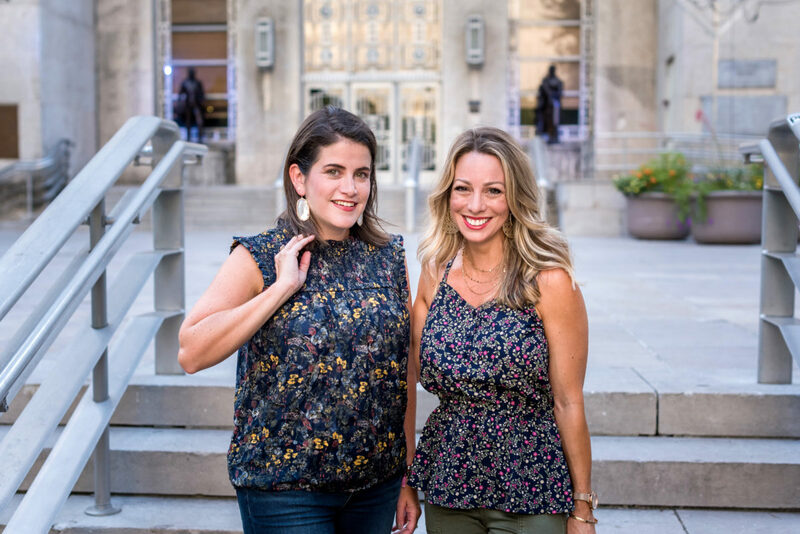 Here are seven summer to fall outfits on both myself and Ali-Shaun for you to recreate. And if you want to see behind the scenes on this photo shoot, watch my Stories today! I know it’s helpful for you to see clothes on people of different shapes, so we’ve got ya covered in this post! We made sure to note our sizes in all the pieces for your easy reference. My Size Reference: I’m short (5’1) and petite, athletic build (big legs), weighing about 110 and wear a 34D bra. I typically wear size 0p/25 jeans, XSP in tops and dresses. 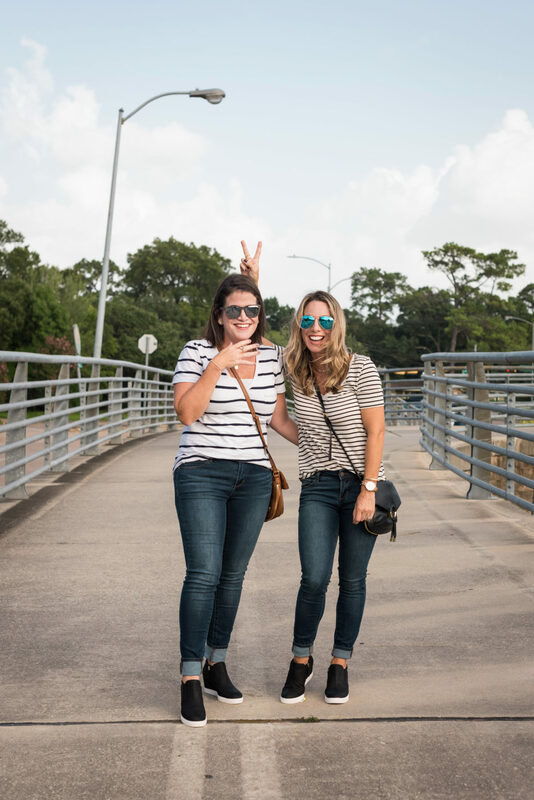 First up, skinny jeans and a flattering striped tee are a casual girl’s wardrobe essentials. Ali-Shaun is wearing the Madewell v-neck that’s been so popular this Spring and Summer. I’m wearing the raw edge v-neck in the Sale that’s thinner and more fitted. 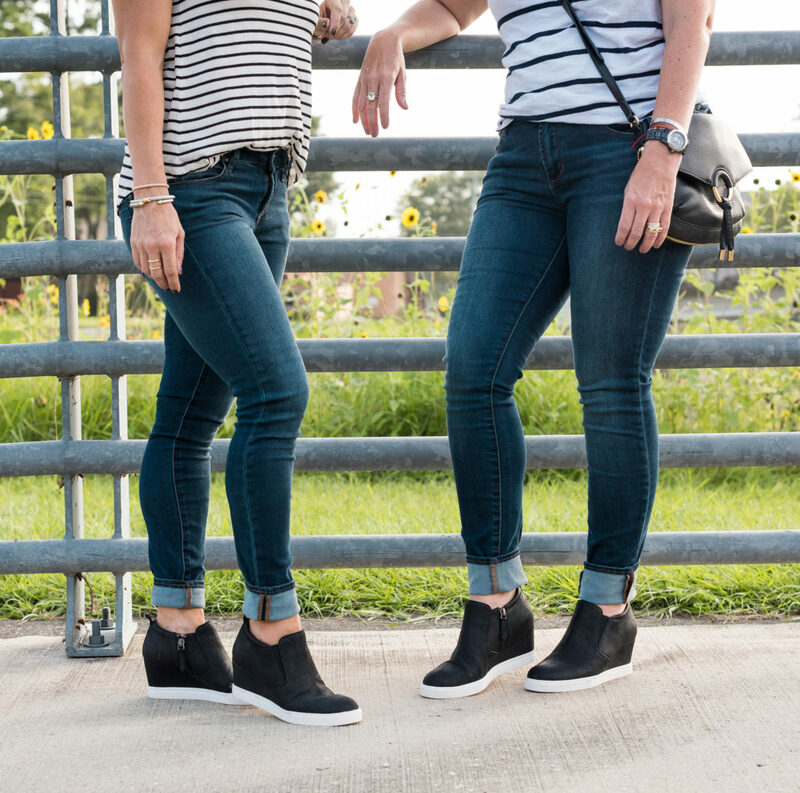 We both loved the Articles of Society Sarah Ankle Jeans for comfort, fit, and price- cannot beat $41! They are between a mid-and low rise with lots of stretch and a bit longer length, so we cuffed ours. The comfortable and cool factor is upped with the wedge sneakers that I’m sure we’ll be wearing the rest of the year. Style Tip: To get this cuffed jean look, cuff the jeans up wide like Ali-Shaun, and then for me, because I’m shorter, I cuff them again under so that they are actually cuffed inside. Does that make sense? 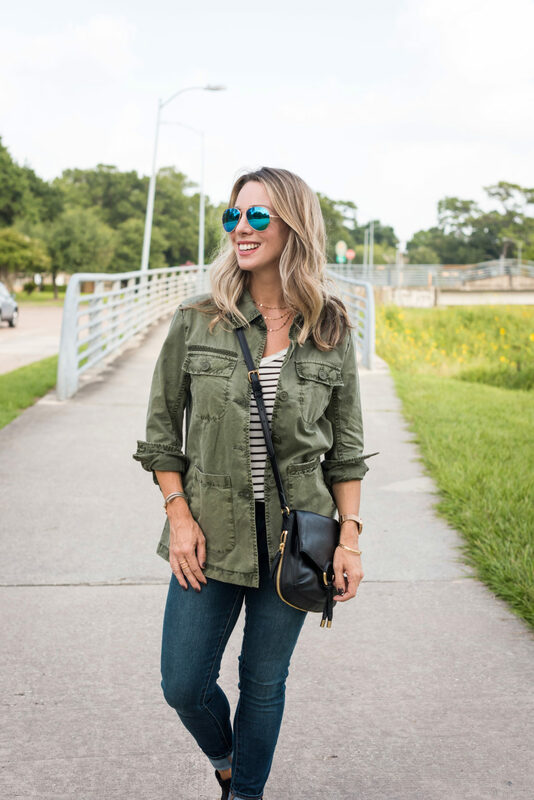 Especially in Houston, we love our military jackets! They are the perfect layering piece for chilly, but not cold, weather. 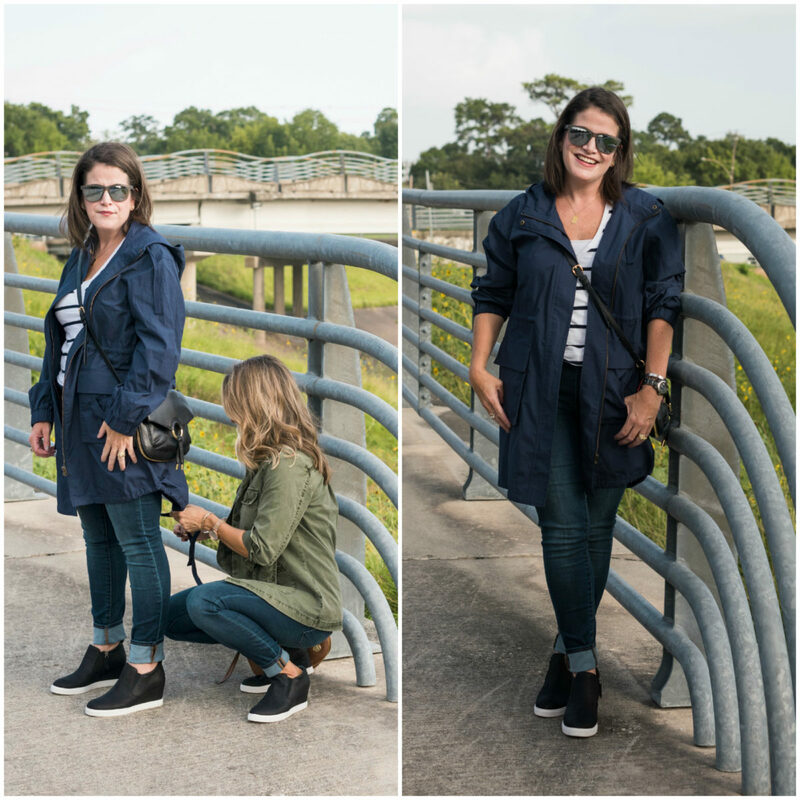 This jacket is more of a button down shirt fit with a pleat in the back and relaxed fit. It also comes in camo! Isn’t the detail on it great?! 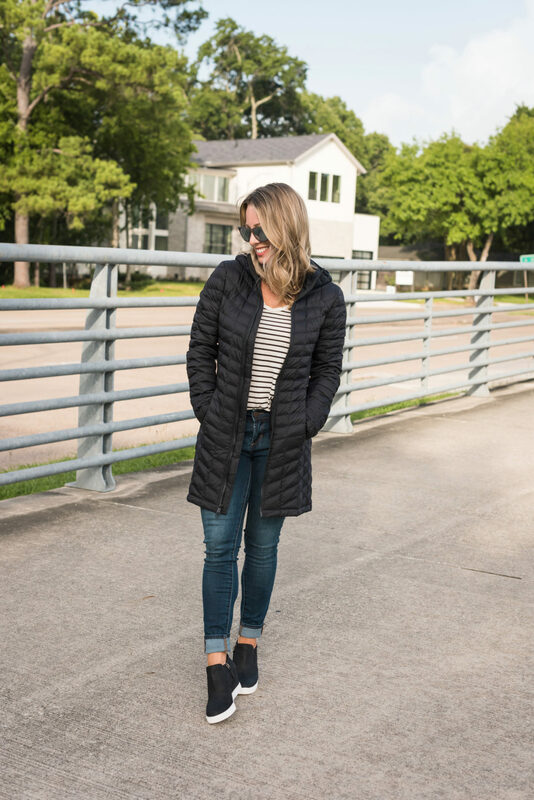 Ali-Shaun opted for the packable jacket in a durable cotton that’s perfect for her days on the ballfield. Her son plays a lot of baseball and their family lives at the fields! This jacket also comes in a fun yellow and pretty pinky/coral. 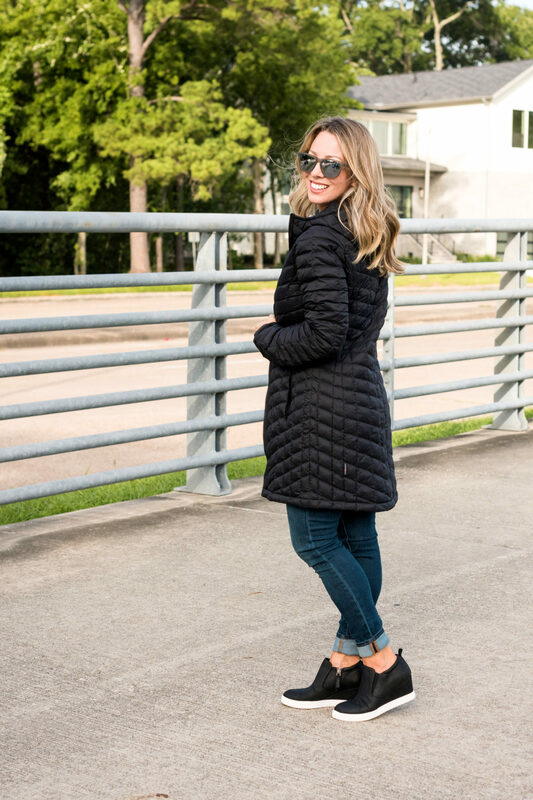 One of my best finds of the Nordstrom sale is this jacket with high-tech PrimaLoft insulation that keeps you super warm, but won’t take up a lot of room in your suitcase. I love the elastic binding at the cuffs that cinch with a cord to keep cold air out and the high stand collar and cozy hood protects your neck and head from the elements. This jacket is equally as good for a lighter weight jacket. I loved seeing Ali-Shawn in jewel tones- they look so good with her coloring and dark hair. 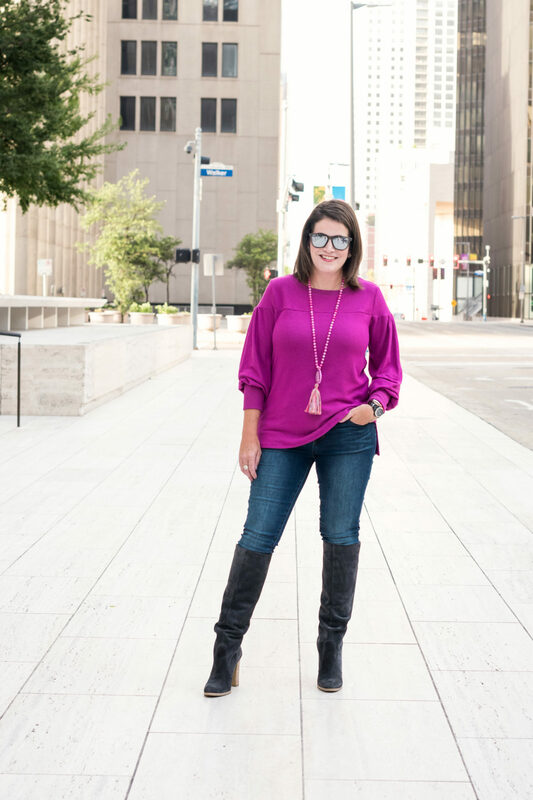 This blouse sleeve sweater comes in lots of pretty colors – of course, I’m partial to the pale pink, grey and black, but for you blue eyed gals, there’s a bright blue that will bring out your eyes. 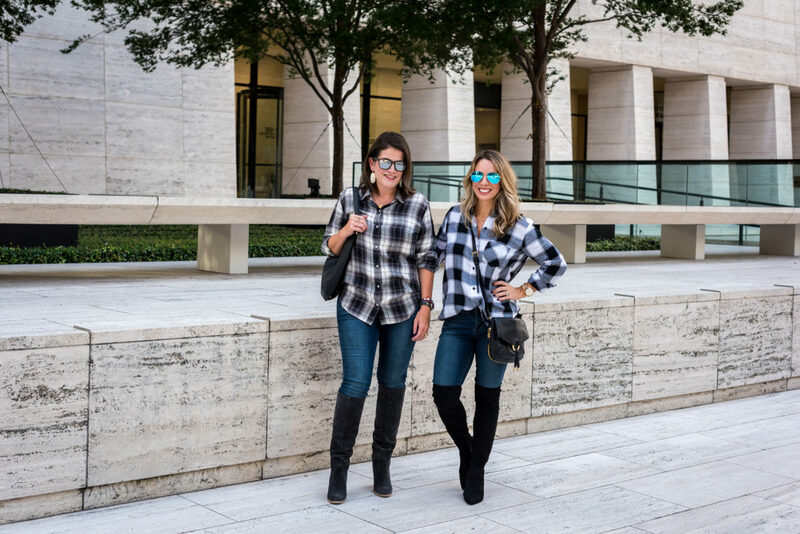 And come Fall, it’s all about plaid button-down tops with jeans and boots! 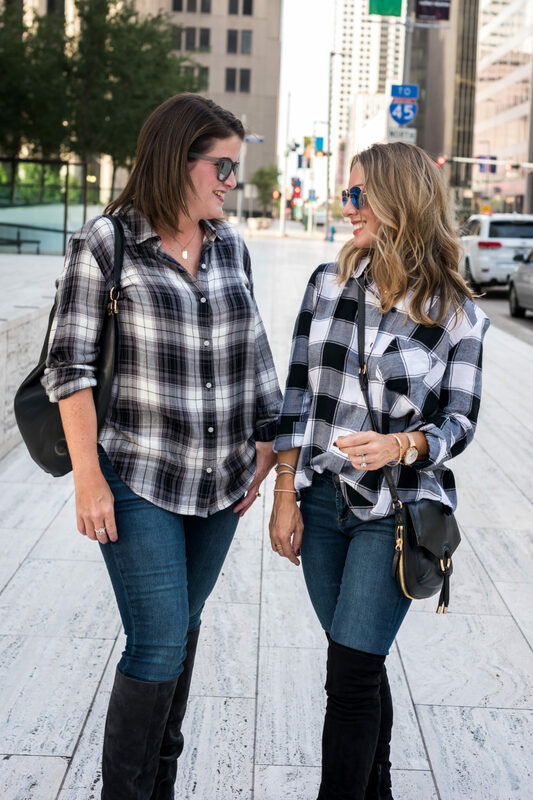 Plaid tops are a workhorse in your closet because they can be worn alone (tucked, tied or untucked), with a vest, cardigan or jacket and work well with jeans, leggings, and skirts! I like to get a few in different colors, but of course the black and white stood out to me. It’s also super soft! 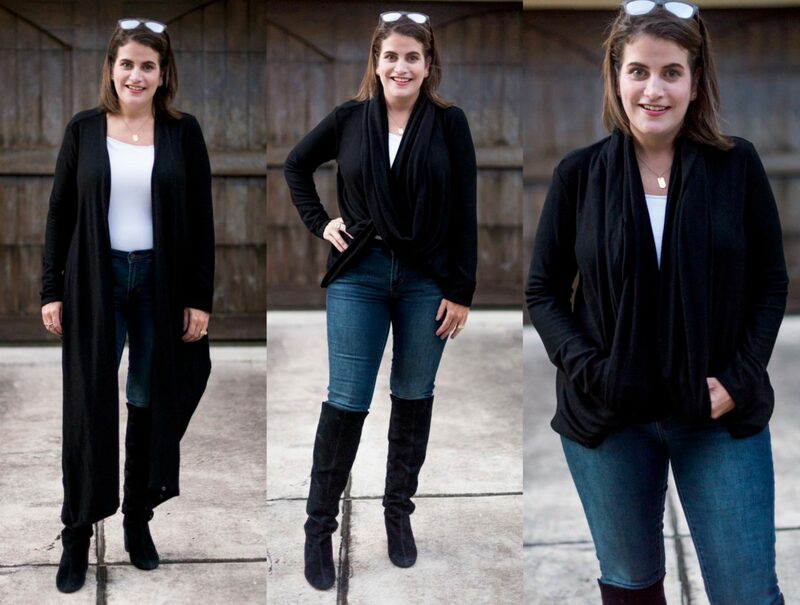 One of my favorite boots from the entire sale are the sleek over-the-knee boots. They are slim and hug your leg without being constricting. The pointy toe elongates your leg, but the heel is on the shorter side and slightly chunky so you won’t feel inappropriate wearing them for all occasions. Ali-Shaun is wearing the Caslon plaid top in the “James plaid” 😉 and I also have it in “Purple Gaston plaid” which is really pretty with a bit of purple/pink. I couldn’t wait to show you Ali-Shaun’s next outfit! It was her favorite from the entire Nordstrom Sale and looks phenomenal on her! And honestly, with those eyes, I’d never want to hide them behind sunglasses! The pretty floral top is perfect for wearing now and later. It has a gorgeous smocked top and looks great tucked in as well with skirts and pants. While I didn’t care for this jacket on me, it looked fantastic on her! The quality is really good, especially for under $60 and it looks and feels more expensive than it is. The ‘blue pearl’ is a nice silvery blue color. I wish I could’ve snagged the Caslon Floral Tank in my size before it sold out, but I love the Gibson Floral Tank. It’s a cute peplum style with adjustable shoulder straps and several buttons at the top. I like it now with the skinny military pants and later with a cardigan layered on top. 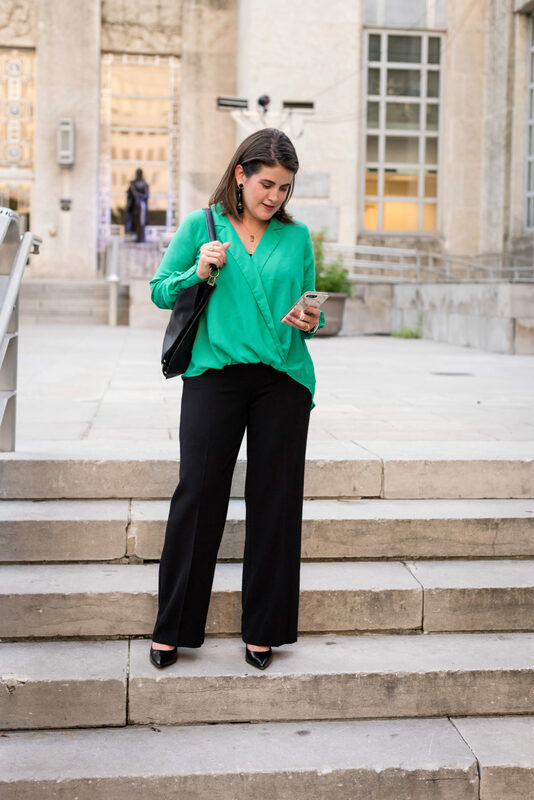 The Caslon Utility Pants are super comfy and stretchy and fit perfectly everywhere with no gaping in the waist! You can dress them up or down and I bet they’ll become one of your wardrobe staples. At under $50, you can’t beat it! Since Ali-Shaun works in a professional office, we wanted to give her some workwear options too. 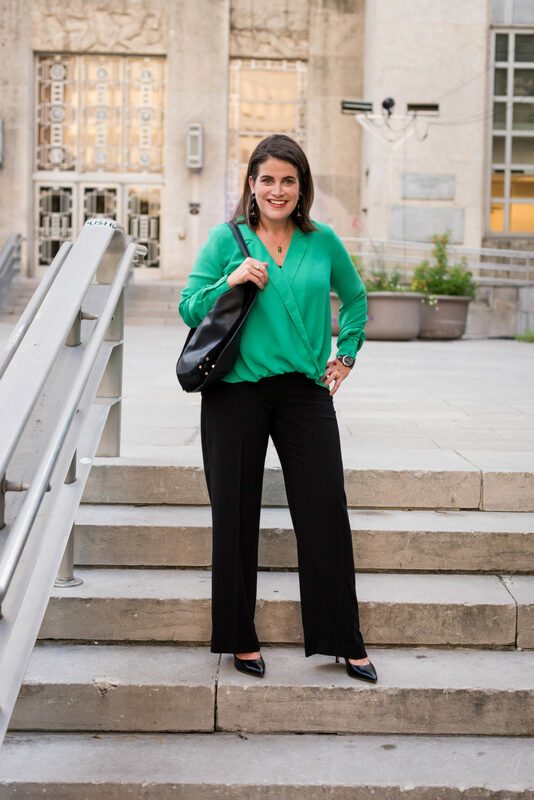 These slimming black pants are the ones she bought in the first Style A Friend post. They’re also comfortable and bonus – they don’t have to be dry cleaned! They’re fitted through the waist and hip, then flare out to create a long leg look. These were just so very flattering on her and she knew she’d get so much wear out of them year round. Good news, they’re $35 off in the Nordstrom sale and still in stock! The drape front blouse is another color that looks so pretty on all hair colors. It also comes in prints (I like the ‘navy recess floral’ best) and stripes. It’s an elegant blouse with a high low cut (longer in the back to cover your tush), and a nice collar with wide cuffs. 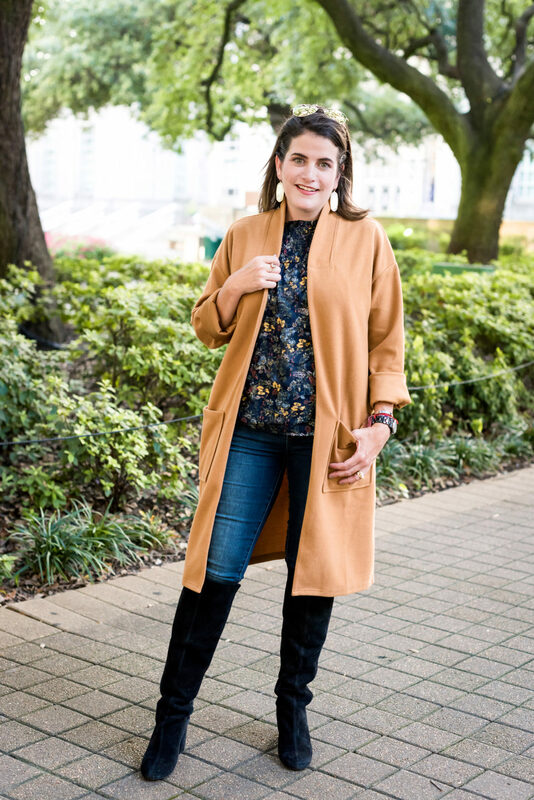 Last but not least, the cozy convertible cardigan that you will LOVE because not only is it super soft, but you can wear it several ways to create different looks! That material is that kitteny soft thin fleecy knit that we’ve gotten spoiled with, so now we want everything that soft! You can get this top in multiple colors, including all the neutrals, a think stripe and a vibrant pinky/purple. If you loved seeing Ali-Shaun here, let us know in the comments and maybe we can persuade her to come back! 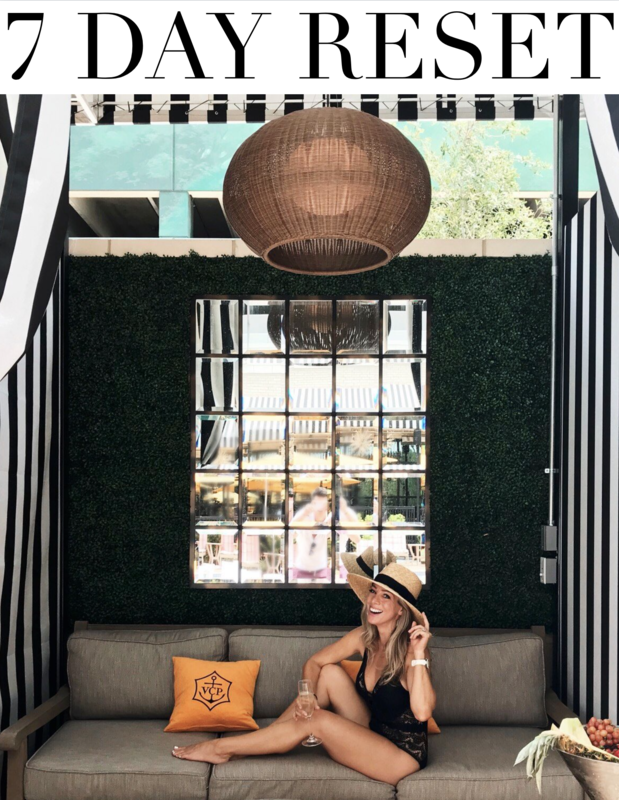 NORDSTROM • Anniversary sale is still going + tons of clearance deals available! My picks: The magic tank dress, the knit maxi and lots of accessories that just landed in the clearance bin! 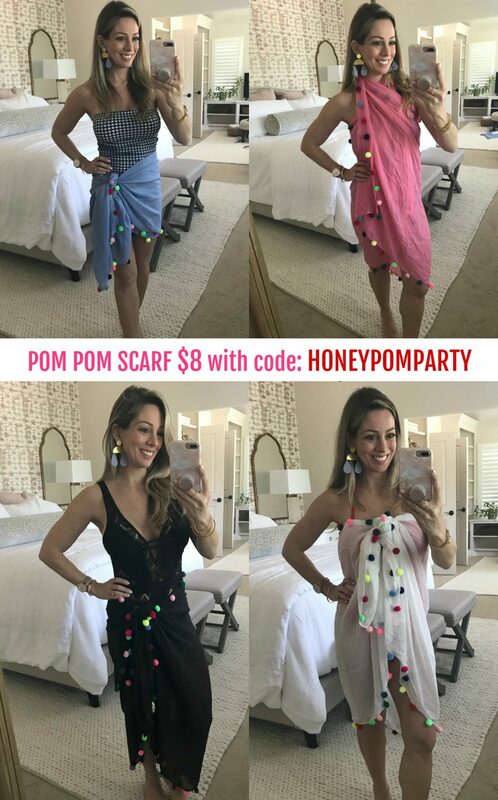 My picks: These beaded drop earrings and this wrap top. My picks: This criss cross back dress and this medallion dress. 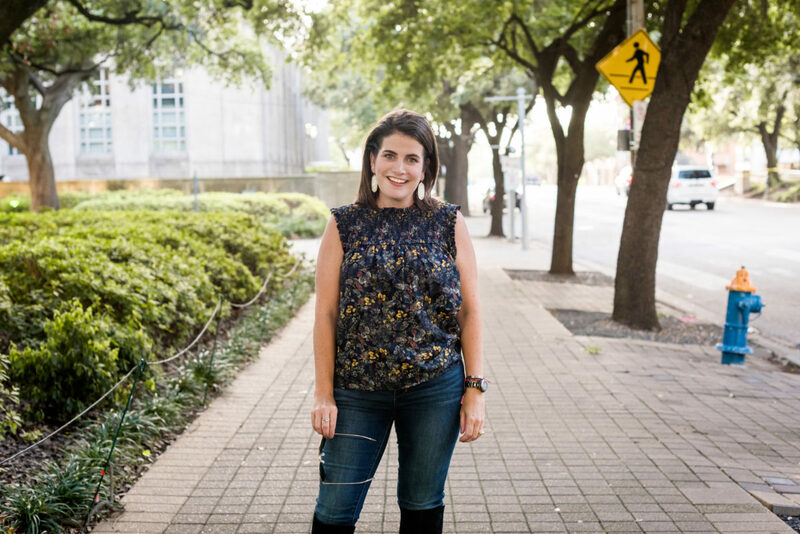 COLLEEN ROTHSCHILD • get the 7-piece Discovery Collection for $69 ($150 value) with my code: CR69! My picks: Some items are still available in the Christmas in July sale! My picks: This button front shirt and this short sleeve shirt dress! My picks: Sooooo many good things! This striped ruffle sleeve top is darling and this scallop cami has a racerback! I loved seeing Ali-Shaun in similar outfits. It’s definitely helpful since I’m closer to her sizing. You two both look so great and have a lot of fun! Would love to see her again in another post. Please bring Ali-Shaun back, I love how bubbly and sweet she is. so much fun!! i love these outfits!! You girl look awesome!! You both look lovely! And Ali-Shaun ROCKS that hot pink sweater! 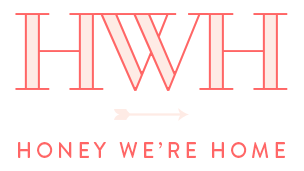 Whoot-whoo! I agree she was especially gorgeous in that one! Jewel tones look amazing on her and people with her coloring! I loved seeing you both! It’s nice to see different-sized bodies in the similar outfits. And I loved seeing downtown Houston, too! I used to work in One Shell (I now live 2 1/2 hours from Houston), so it was fun to see familiar places again. I especially love how you two good friends act together. Oh yes! That’s right where we were! Ali-Shaun in that hot pink and emerald green top is just perfection! Those colors look amazing on her. I love seeing y’all do these posts together. 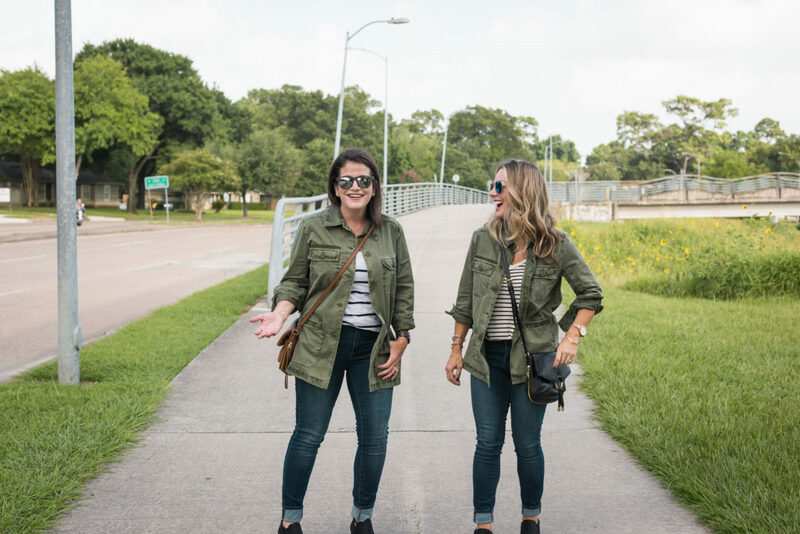 Huge props for styling the coats outside in the 100 degree weather we have been having…..y’all must have been about to melt! Definitely bring Ali-Shaun back! 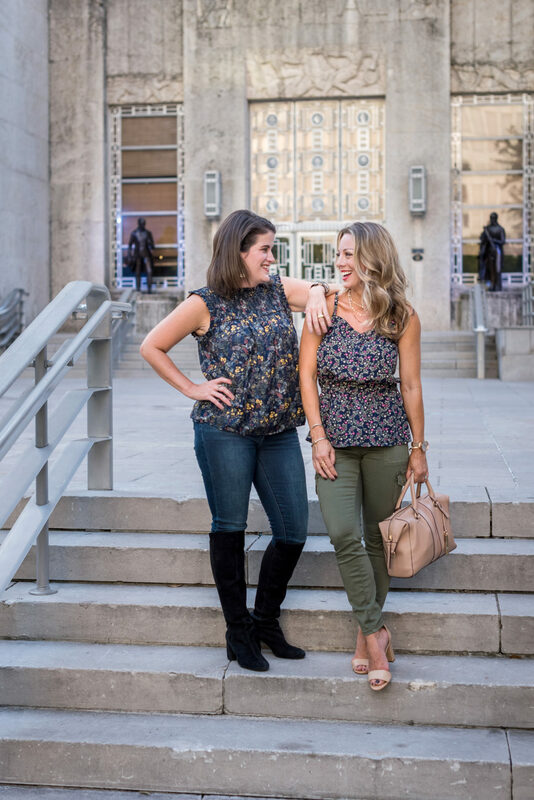 The outfits look great on you both and really help to determine sizing, but what’s even better is seeing your sweet friendship shine in the pictures! Thanks so much Cathy! She is such a great friend as I’m sure you can tell! Please bring Ali-Shaun back! She’s just the cutest! Love all the oufits on you both! Looking fantastic- both of you! I love seeing Ali-Shaun on your blogs- insta stories! I particularly love to see the clothes you feature on another frame. I am 5’3, 127 ish, so right smack dab in the middle of you two regarding sizing. I really appreciate the specific sizing guidelines! She looked gorgeous and it’s great seeing how the pieces fit on different body types! Really enjoyed this post. More of you and Ali-Shaun together! Thanks so much for that Elle! I’m gonna tell Ali-Shaun she needs to come back! You two are so fun together! Love the posts, and I agree with bringing Shannon on too! 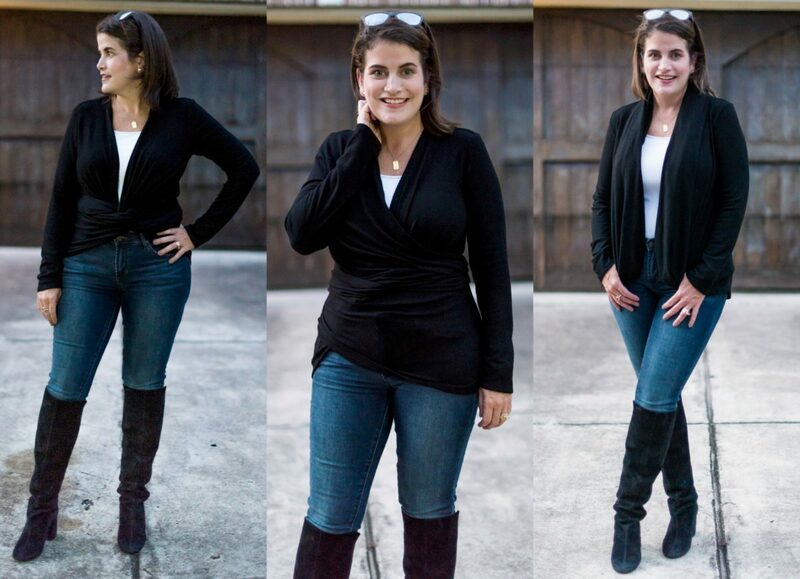 I cannot wait to get those over the knee boots–I got them in both colors. I love these types of post. Girlfriend is looking great. I would like to see a large sized lady modeling also. Yes, bring her back often! I love the green on Ali-Shaun. favourite choice for her. Such a good post – great to see on different sized gals! I’m gonna tell her she needs to come back! Love seeing Ali-Shaun, she is my height so it helps to see the clothes on her as well. Thank you so much for letting me know! I’m so glad seeing the clothes on her is helpful! 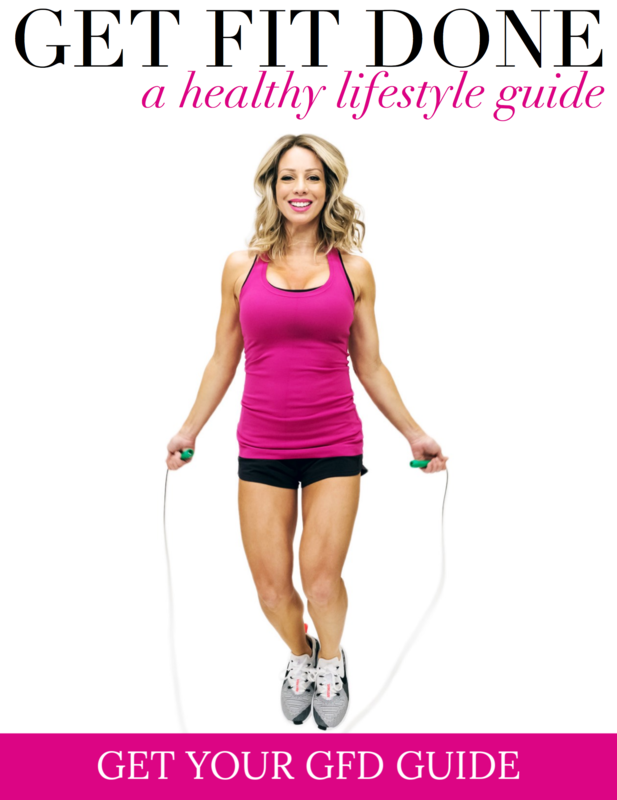 Gosh, I just love when you bring Ali-Shaun onto the blog! Girl looks amazing in color-she’s rocking that bright pink and emerald green…but I love the camel coat/cardigan on her as well! I love both of those looks on her too! 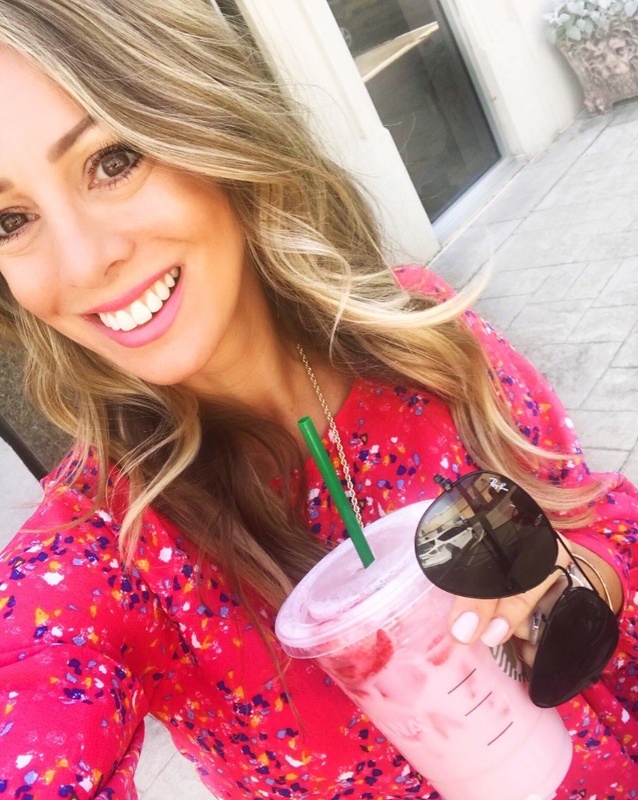 I love Ali-Shaun in the blog! She’s so fun and you all both rocked those outfits. And I agree, she looked STUNNING in the pink sweater!! I loved that one on her too! Jewel tones look so good on that coloring! I agree! She looks fantastic! Great post! I loved seeing the clothing on different size figures. Megan, you always look great! I am closer to Al-Shaun’s size and have been wondering if a pair of those tall black boots would work for me. 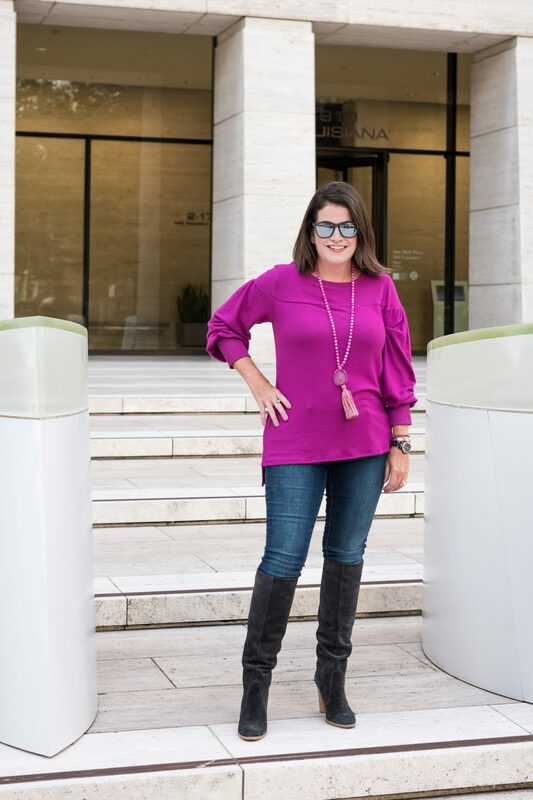 Ali-Shaun, you ROCK that outfit with the pink sweater and black boots – I did a double take!! Oh yes, I think you need those! They make your legs look killer! !